With an almost frameless panel and ultra-thin speakers running underneath it, Panasonic's TH-42PX60B is a space-saver, able to fit into places where wider sets with side-mounted speakers could never manage. 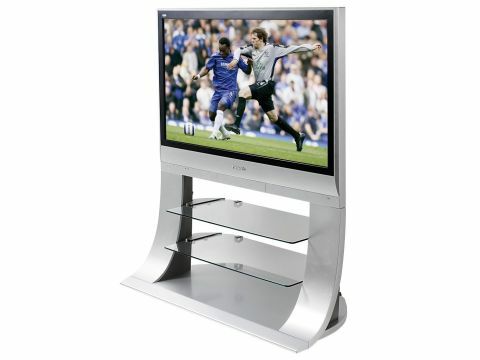 The set's silver and glass pedestal adds more style, but an optional basic stand is available for a £350 saving. This TV doesn't overwhelm users with flashy features. A digital tuner is present, as are two HDMI sockets, always a welcome sight. It also has an HD-compatible 1024x768 resolution, but there aren't any revolutionary picture-processing systems (the TV does provide all the basic controls you're likely to need), and audio tweaks are limited to an 'Ambience' setting. The set's other sockets include three Scarts (two RGB-capable), component video inputs and a PC input. A common interface slot is present for pay-TV smartcards. Standard-definition pictures have a film-like quality to them which would be at home in a multiplex. Although they're detailed, they don't have the extraordinary sharpness of other sets. Switching over to high-definition feeds reveals an uncannily crisp picture. In both cases the TV provides a broad colour palette, and solid blacks where even the deepest tones remain convincing. The picture isn't perfect though. Motion can get jerky during slow pans, and colour and brightness banding can occur in poorly-lit scenes. These faults rarely occur, and for most of the time this plasma puts on an excellent performance. The audio performance is adequate, sounds and dialogue are crisp and accurate, but it doesn't set a new benchmark. The Panasonic TH-42PX60B provides excellent pictures and good audio, with the bonuses of style and ease of use. You also get excellent value for-money, especially given its top performance.